A MISSING person’s initiative run in Dumfries and Galloway over the past year is expanding into other parts of Scotland. 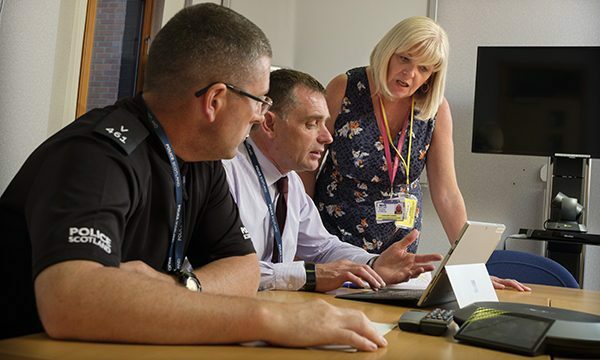 The Herbert Protocol was launched at the end of 2017 – resulting from discussions between Police Scotland and NHS Dumfries and Galloway’s Interventions in Dementia Education, Assessment and Support (IDEAS) team. Lorraine Haining is Partnership Lead in the IDEAS team, and she said: “This project was developed in recognition of a general increase in the number of people in Dumfries and Galloway being diagnosed with either Dementia or a Learning Disability. “Conversations took place with Police Scotland about how we could provide better assistance in any situation where someone with either Dementia or a Learning Disability is declared missing. The Herbert Protocol puts in place the ability for carers, family members and friends to complete in advance a form about an individual which records all vital details such as medication required, phone numbers, places located and a photograph. Lorraine said: “We’re absolutely delighted with the response to this approach. As of yet, the Herbert Protocol has not had to be implemented. Lorraine said: “Ideally, we would hopefully never be in a situation where the Herbert Protocol ever needs to be used, but if there is an occasion where someone is missing then we believe this approach really improves our ability to locate them quickly and safely. The Herbert Protocol initiative is named after George Herbert, a war veteran of the Normandy landings who lived with dementia. And although a police and NHS-led initiative, the initiative which went live in October 2017 has been promoted across Dumfries and Galloway by third sector organisations, The Scottish Fire and Rescue Service, Galloway and Moffat Mountain Rescue Teams, The Food Train and residential care homes. The initiative went live in October 2017. DI Robin Ferguson of Police Scotland’s Public Protection Unit said: “Working in close partnership with the IDEAS team and other non statutory partners, as police we have welcomed and identify the benefits of this local agreement, not only for the police but more importantly for the missing person and their family.